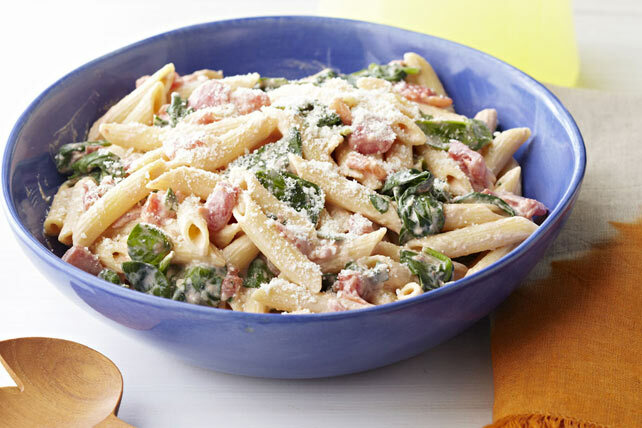 Serve this Creamy Pasta with Spinach at your next dinner party. Explore this recipe today and learn more about this simple (yet delicious) pasta dish. Meanwhile, heat oil in large skillet on medium heat. Add garlic; cook and stir 1 min. Stir in tomatoes; cook 3 min. or until heated through, stirring frequently. Add cream cheese and lemon juice; cook and stir 3 to 5 min. or until cream cheese is melted and mixture is well blended. Place spinach in large bowl. Drain pasta, reserving 1/3 cup cooking water. Add pasta, reserved water, tomato mixture and 3 Tbsp. Parmesan to spinach; mix lightly. Serve topped with remaining Parmesan. Add 1/4 tsp. crushed red pepper to cooked tomato mixture along with the cream cheese and lemon juice. Prepare using rotini or mostaccioli.